Last but not least : we're moving ! This is my last post here : now you can follow me (and see all the Travelers pilgrims' story) on my only blog. We'll see you there ! 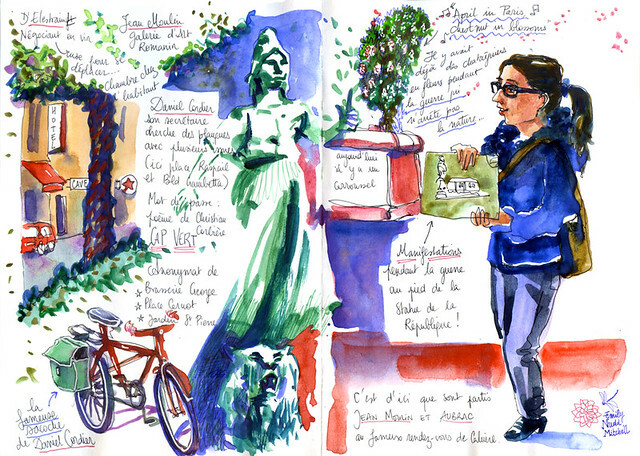 "La fille du 14 juillet..."
We visited Lyon and they came with me to the students exhibition of the art school where I teach, ECohlCité. That's how I could really hear my brother joking in chinese with students coming from China ! The world is not as big as we think ! If you go to Shenzhen, you can visit their treasury bookshops "Simple Things" : it's here ! 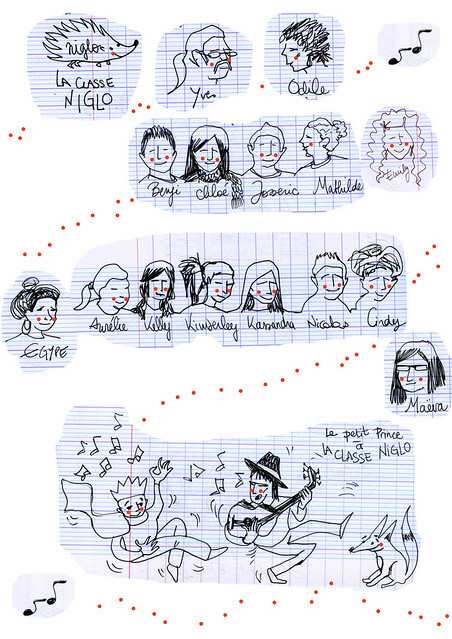 Last day at the Niglo Classroom : let's play music ! Parno Graszt and Gipsy Punk Gogol Bordello MISHTO ! This video is so full of life, just like the children I met this year with the classe Niglo. On the video some Hungarian singers, below on the pics some Roma People of Romania and Albania. The sons of the wind have been put inside borders, but they still keep their language and traditions ! Tuesday was our last day at classe Niglo. 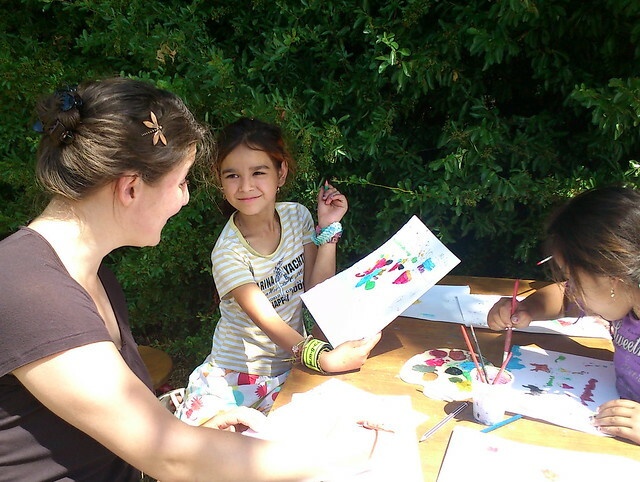 Like in a "real" school, the teachers Yves and Odile prepared painting sessions and cake parties. Can you imagine it's the only school in the world where children cry the day of summer holidays ? About fifteen children ran to us laughing. 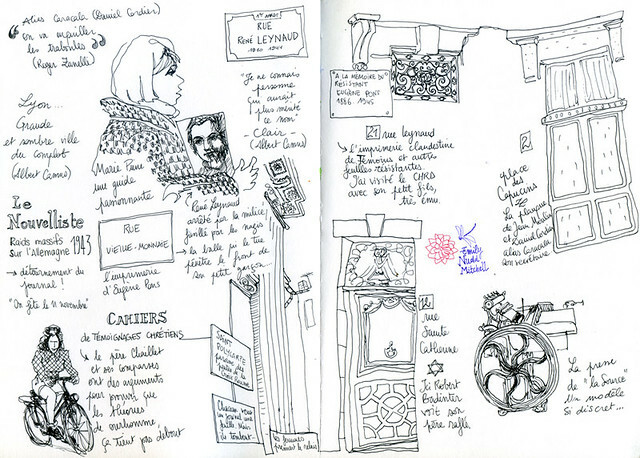 Some knew Yves and Odile in some other places which they've been evicted of. 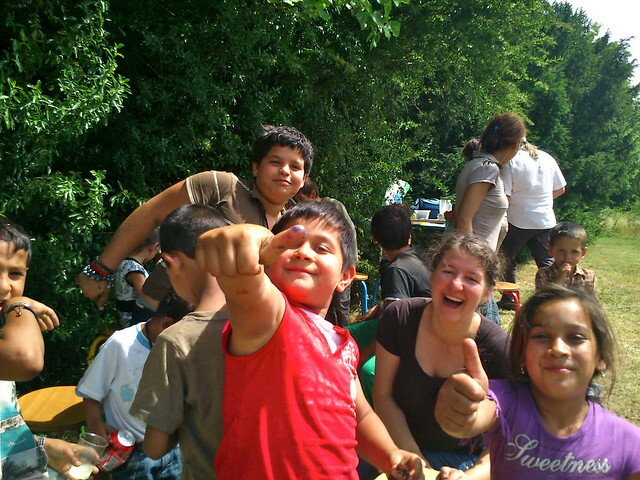 I recognise two little brothers, Elisei and Janou, I met them last year in Vaux-en-Velin. Elisei went to school, he speaks really good french. 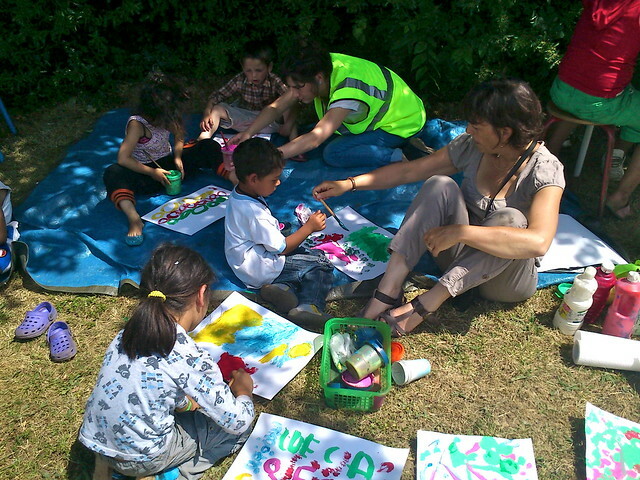 Yves and Odile ask children to form three groups. The little ones on a cover, full of tempera and graphic splashes. It's the little Janou who's taking the pincel in Odile's hands on the picture. 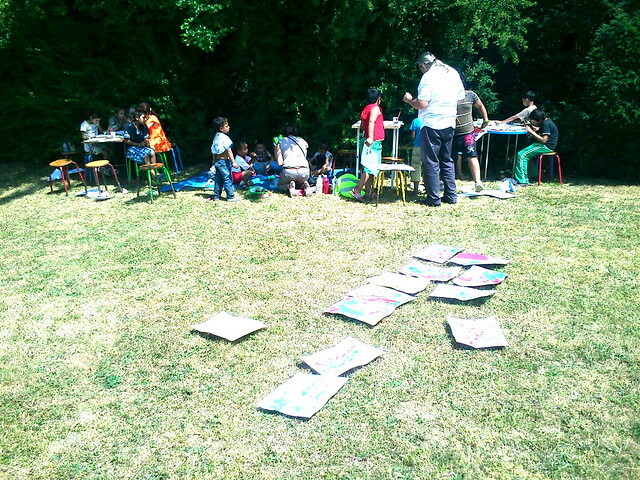 The eldest ones like Elisei or Yosef seat around a table and realise beautiful paintings which dry up in the sun. The third group, made out of 6-8 years old, draw with graphite pencils some forms I show them slowly. Yaco wants to draw a dog, Sherban a truck. I show them the "ears" and the "wheels", the "back" and the "trailer", hop a bit of words to learn drawing ! After that we put on the colors. They tell proudly "yellow", "blue" or "green" in french when the painting sets appear, without any mistake, just a nice singing accent. I only learnt "calo" which means black in Romani, incredible for such colourful people ! In the end children get their painting. 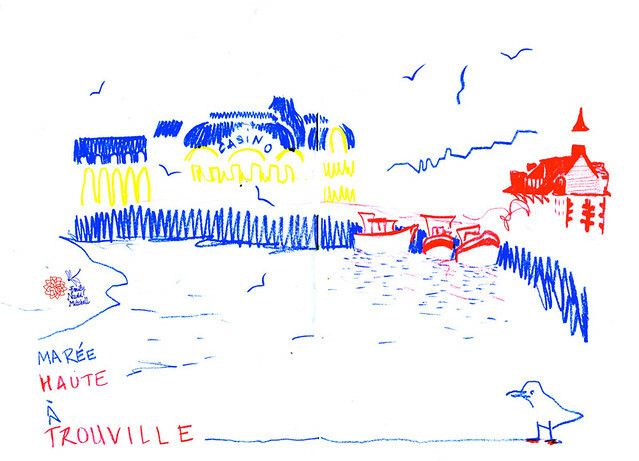 Below Samuela shows you her drawing full of colours, just like her. And now fiesta ! Cakes party ! I made two great cakes with apples of a local farmer. Volunteers and teachers brought many cakes and sweets and drinks... and above all cooooola ! A real party ! So now I'm nostalgic just like them : it's summertime holidays, can't wait for september !!! In the morning, we also had a cake with Albanian children. We were near a squat, this lady in green asked me to take a picture of her with her friend and baby. "Thank you so much for the cake, great moment, it's so hard here you know !" Soon I'll post here my drawings of gipsy pilgrimage. Meanwhile I post a nice piece of gipsy punk : Gogol Bordello, who sings punk in Romani with Madonna. The pop star defends Roma people. Beware, this video will make you dance ! I really love to hear them playing the violon in a punk way shouting "Mishto !" just like the guys when they score at football ! 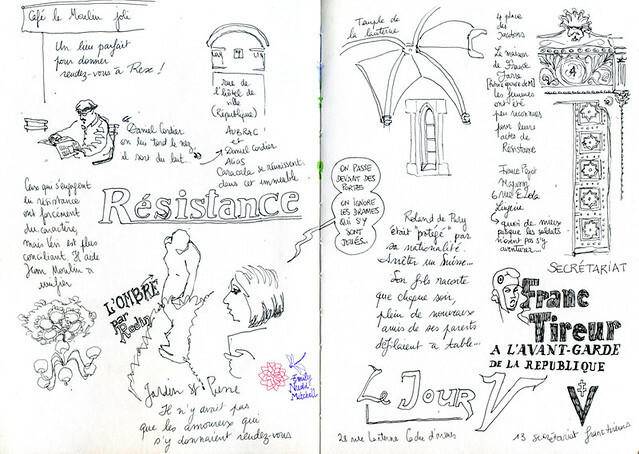 During the week-ends, CHRD museum takes you around Lyon with Jean Moulin. Guides are so passionate, each pause is about a little story about Lyon at Resistance. They show us posters, pictures of people or squares, ain't changed that much ! Carnot square, near Marianne sculpture, people used to ask for the Republic back. And that's just around the corner that Jean Moulin had his hideout. Always with two exits, not that easy, except in Lyon's traboules ! Our guide tells us that memory work is not easy. The exhibition Fashion during the war couldn't have been shown before. Transmission comes after digestion. Later she tells us about a man who remembers during the war, he was asking his Swiss father why they had so many people sharing their dinner, never the same ones. No worries, son, they're just friends. Well they really had many of them !" A bit further : "Here was the underwear boutique of France Pejot, wife to be of Maurice Jarre, the great movie music compositor. Soldiers didn't dare enter in such a place, they were too shy. Women knew it and always hide clandestine tracts under their lacery !" If you like it you should read "Folles de Django" by Alexis Salatko, well you'll see ! I think that's the right time to think about my grandfather who wasn't neither French and landed on Utah Beach along with the 2ème DB. I always look for him on these pictures. 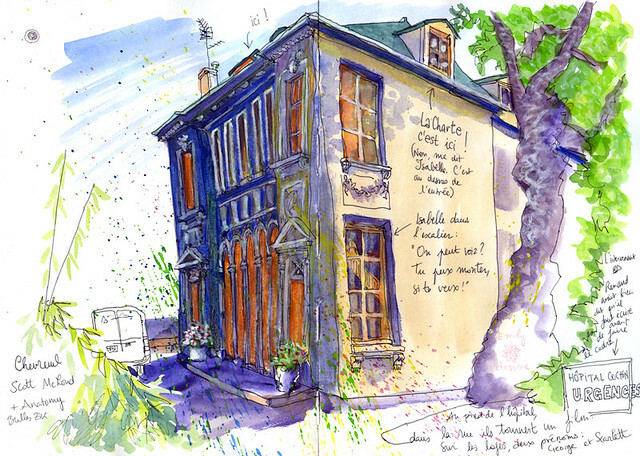 There's been a wedding on the 1944, june the 6th at Sainte Mère l'Eglise in Normandy, now you see everything is possible. 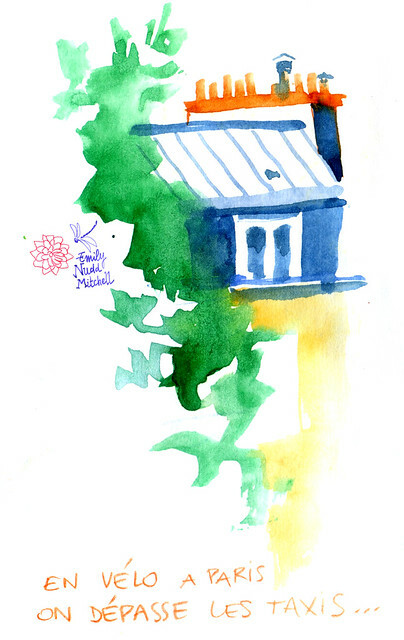 In the middle of this garden springs proudly the Hôtel de Massa, a writers house built for Balzac and Victor Hugo (and others). They decided to get united in a society to protect their rights : this is still called Société des Gens De Lettres (Literature People Society). Over time other Literature societies joined up, such as Children books society, la Charte Jeunesse, which defends our rights and allows us to catch up with colleagues. Authors all year long can attend to trainings. It's just like going back to school below friendly's attention of Alexandre Dumas and Régine Desforges, illustrious former Presidents. Dominique Lebrun, who's a writer and SGDL Secretaire, tells us the great story of this mythical place. Actually in this room we're not allowed to put our glass of water right down on the table : everything is of historical interest, even chairs ! Its' just magnificent. It's right there in this room that they got ready for the trial against google pirates and they won. And it's right there they tell us about writers' condition : we're fifteen writers attending to this legal rules lectures. 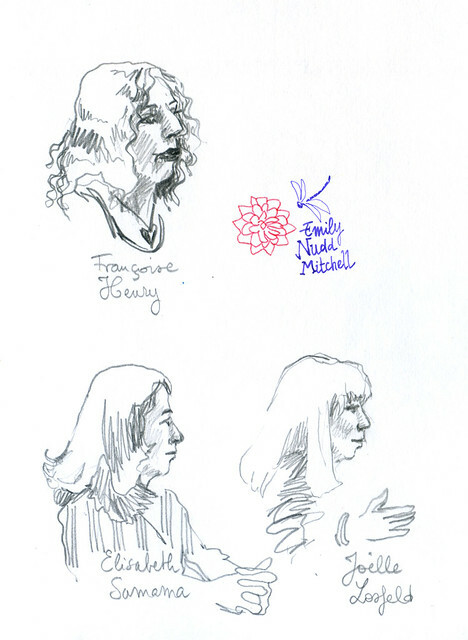 Speakers are professional : writers, publishers, lawyers. The fifteen fervent writers come from various universes. There was like a travellers' wind blowing on our promotion ! Translators Françoise, Hélène and Agathe for english, Azita for persian. Lastly Dominique who writes theatre, Danièle who writes books to study history, Béatrice biographies, and Claude, specialist of Rimbaud. 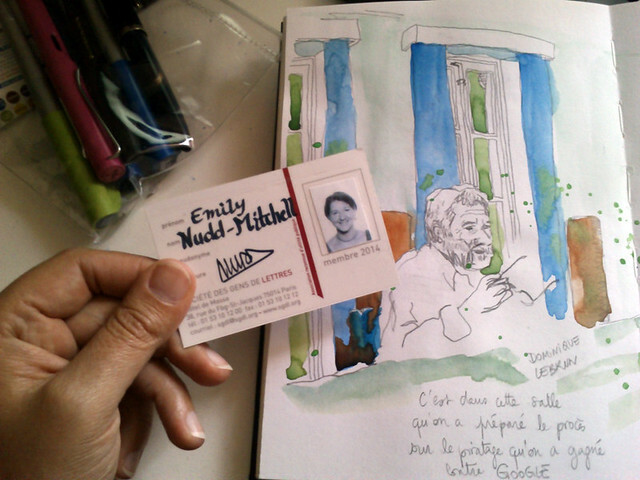 Sylvie poete, and me, illustrator and sketchbook artist. A complete fan of authors' aspects ! We just studied, studied, studied and I wish we had more time to speak all together ! Fortunatelly, I had time to sketch the area I had never seen. 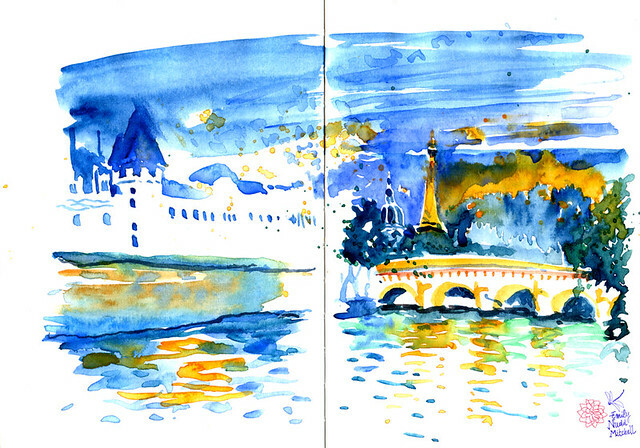 The Seine river by night, black out : I'll discover later I painted with orange instead of yellow, how funny ! I didn't know 68' May's block, well guess what, there's still a gaz station of this time ! Suddenly, Broca street under the bridge ! Gripari's tales one, my childhood's one, incredible ! 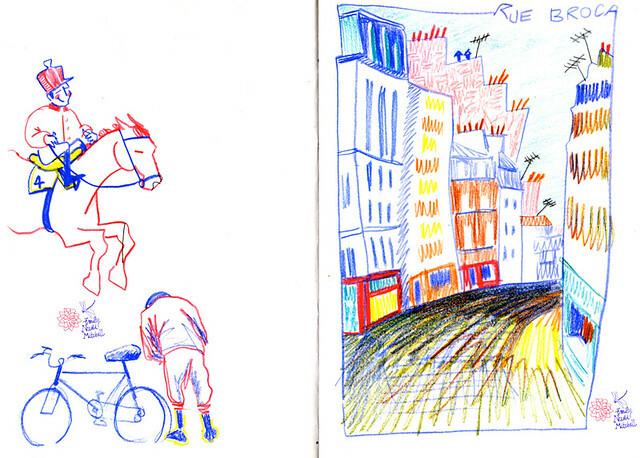 Hop, I get my five years old back and draw just like if Nadia and Bachir and the witch were here ! 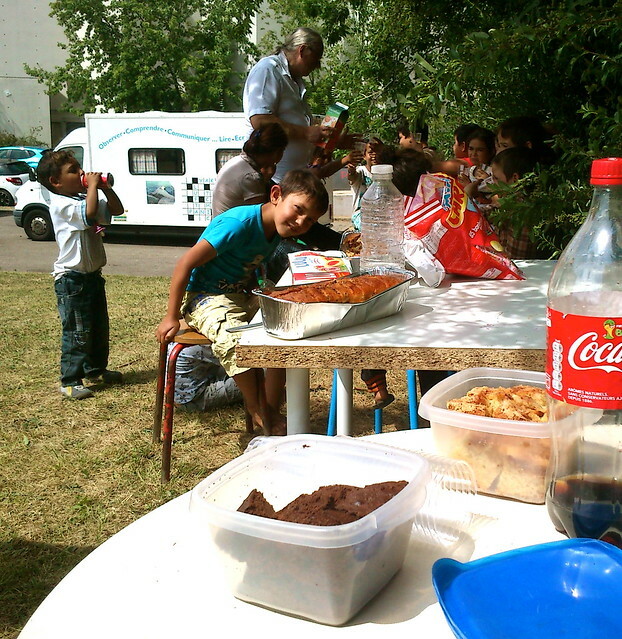 I met again with Yves and the Albanian children of refugees living under Kirchner Bridge in Lyon. 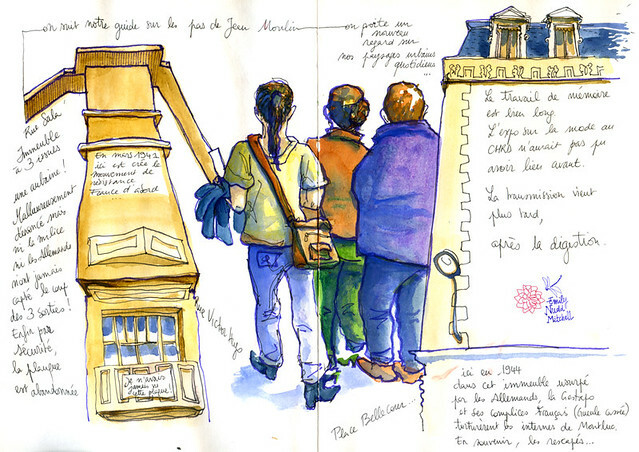 The same we met last june at Carnot square near the station. At fall, they were able to live the bridge for an algeco village, better than nothing for winter. It really looks like a little village. 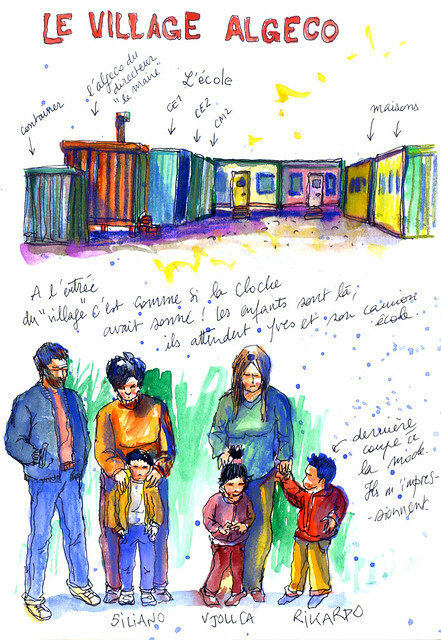 As the Roma people in Vaux-en-Velin, who built a big hut as church-party-mayor place, they also have a "neighbours atmosphere" with women chatting at their doors and men smoking in the middle of the U place. Actually there's even a container for a social worker, a sort of mayor indeed. Yves parks the truck in front of the gate and opens the little door of the truck. Mummies make their children climb-up in the warm classroom. I recognize some of the Kirchner bridge children. The truck classroom can welcome 10 children, there were 98 over there. Bayram is still the same, smiling and polite : under the bridge they were already so clean and well-dressed, parents make miracles. 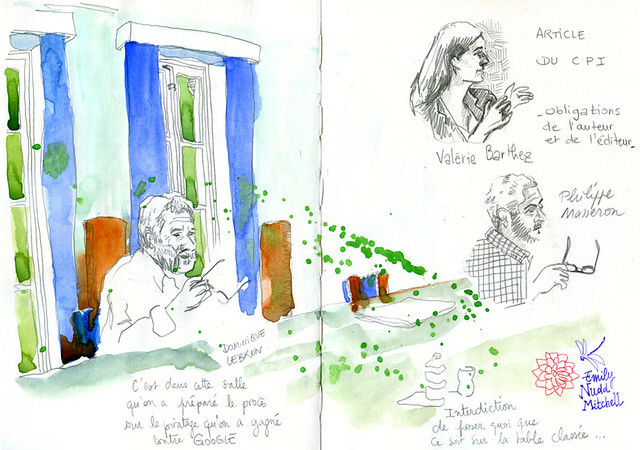 Yves makes the children sit around the table, gives them their notebook and begins to teach. I help the youngest ones to hold their pen and realise "l" and "e" : who remembers it's been so hard to learn how to write ? 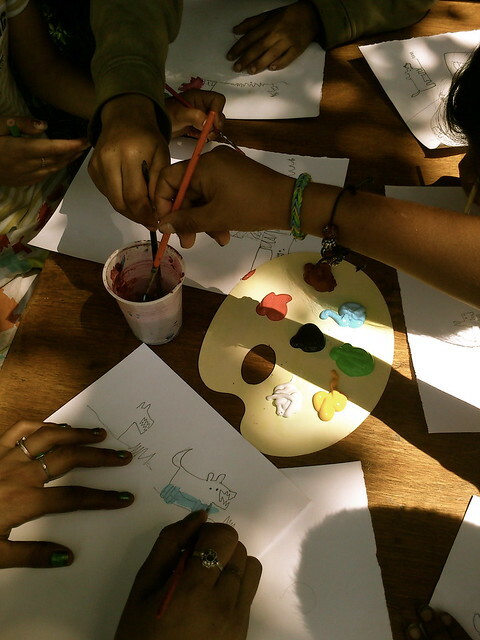 Children do their best with multicolore markers. Sure to make it ! Rich moment, Yves tells me it's the first time Shykyri writes down his name by himself. We sing a bit ot "une souris verte, a green mouse" typical childhood song, and the lesson is over. Mummies' time ! Yves gives them things people let him for them : saucepans and pepper mills, clothes and tea sets, an old eggs mixer. They smile, clearly moved : they ain't have nothing. A WWII camps survivor gives a lecture and tells us about the gipsies discrimination by nazis. He tells us about his childhood in a caravan with horses, acting as a clown and acrobat for his parents' circus, and helping also for the cinema show, bringing culture to little villages and countryside. Teacher Yves was a the lecture ! ASET teachers really involve themselves in Gipsies culture : the more they get the codes, the more they reach their teaching goal. For example someone told me once : "Gipsies parents take their children to school more than before, they care more about their children's future." I found it amusing as I thought the same before : " What ?! They don't take their children to school everyday ? Unacceptable !" Clearly, I didn't have the cultural codes. There's no future idea for gipsies, they live day by day. It doesn't mean they don't care about their children, they do, children are gipsies culture's pilar actually. 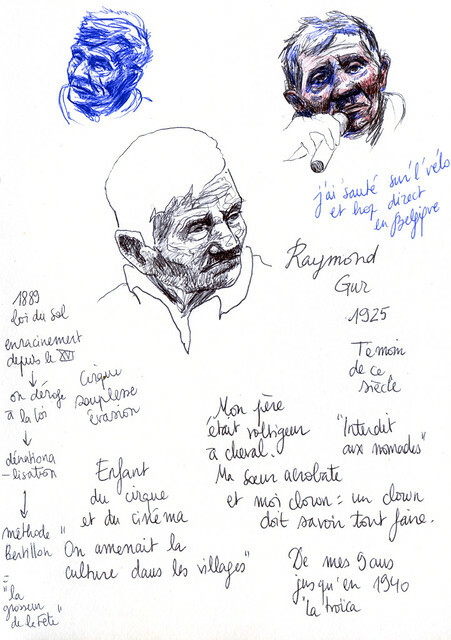 At Beaurepaire festival, where I presented my work with Gipsies at mobile school, a lot of visitors shared their Gipsy experiences with me. This culture moves us more than I thought. I hope one day we ain't scared anymore, neither them nor us. I hope one day we cross the cultural borders, keeping their richness as a treasure. 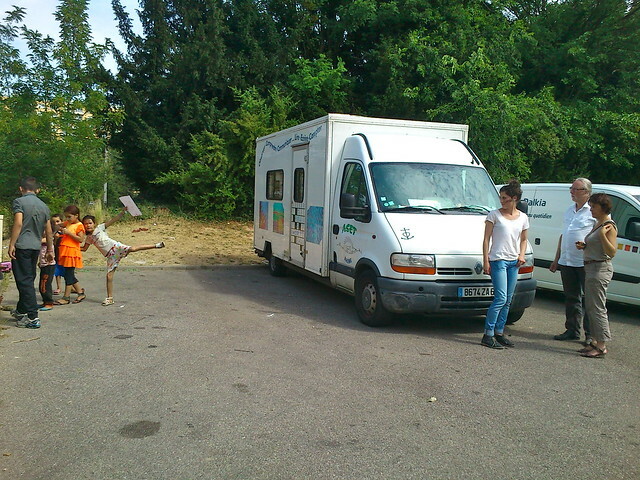 Ok, the trip goes on : We're driving the school truck down to the Saintes Maries de la Mer ! I'll post here my drawings at the pilgrimage. 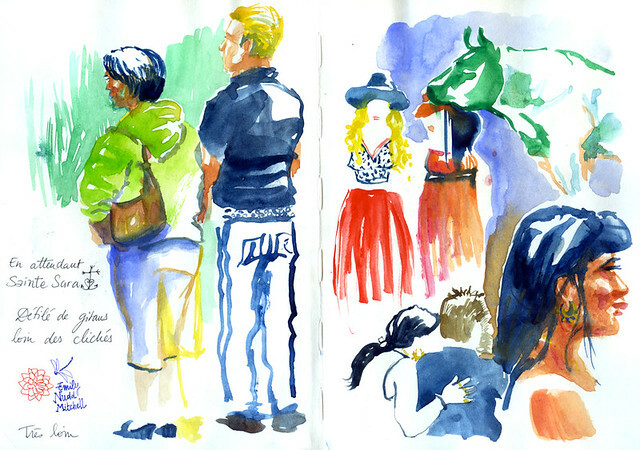 At last, little photos of the festivals ! 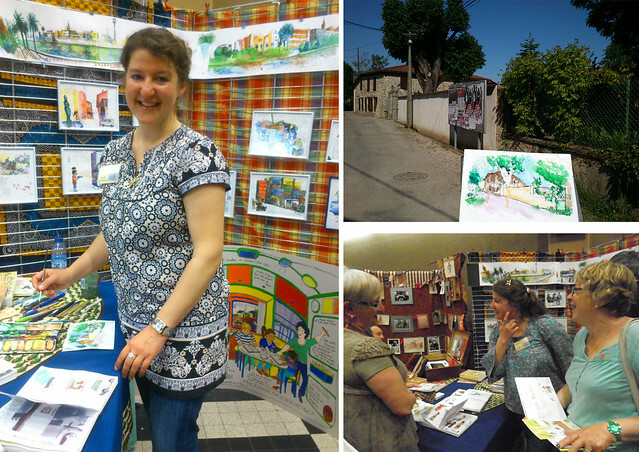 My exhibition stand at Beaurepaire, and top right a drawing I made for my host. 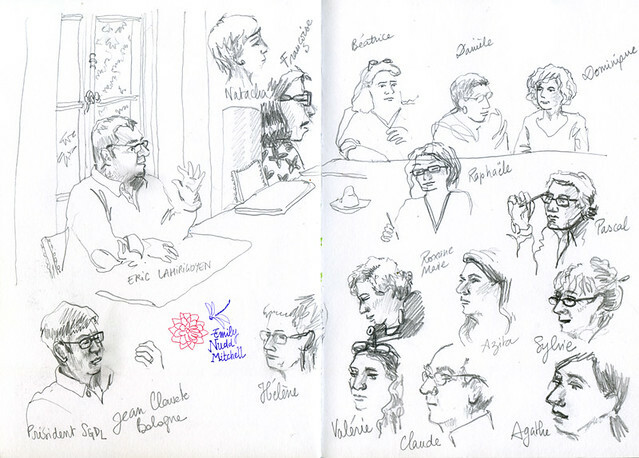 Beaurepaire, a fantastic sketchbooks festival. Catherine and Maryse, volunteers, authors are warm welcomed, we feel like being at home. 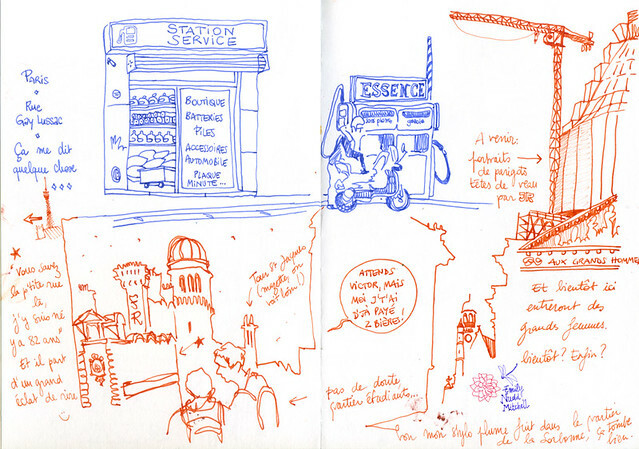 Guess what, I was at a married couple's place, and their son realises documentaries about trucks restaurant in Normandy : I was in chock, I grew up near one of these restaurants on the National Road n° 13 - Caen-Paris : anthropologic anthology ! 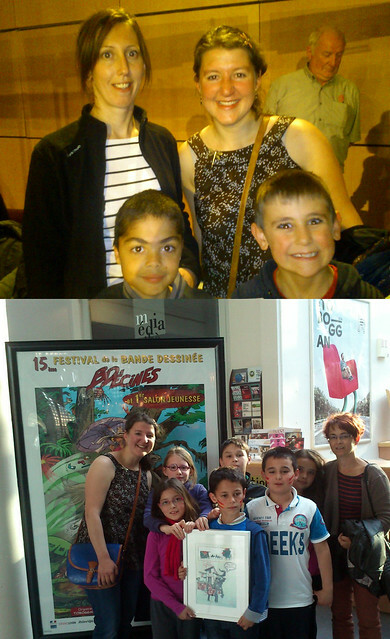 At Décines, the contest "comic BDécines" gave a price to 2 groups I helped to realise their comic about travelling. 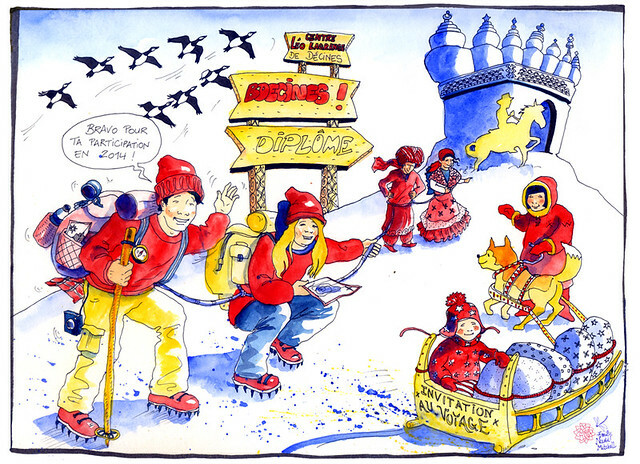 A rap singer who goes around the world for Amicale de Beaujeu in Beaujolais, and a little desert fox who wants to visit the Alps with the help of Karim the gull for the school at Charpieux Décines. 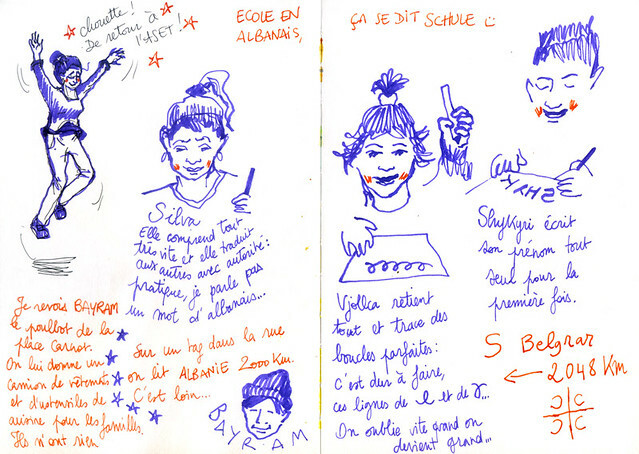 Our comic with teenagers at ASET "The little Prince at Gipsies Planet" was a bit serious for a children jury, but it got success for festival visitors who could have a look at gipsies way of life through the eyes of the little Prince, full of poetry and humour. Thanks to the organisators of these two fantastic festivals ! "No no no, Yves, no way ! We ain't speak about us Gipsies, forget it !" The seven teenagers watch us, puzzled eyes and crossed arms. Our idea is not really on her way, but we still hope for it. Actually Odile thought we could take part of the contest at BDecines comic festival, guess what the theme is this year... Travellers (Gipsies are called travellers, Voyageurs, in France) : fantastic ! 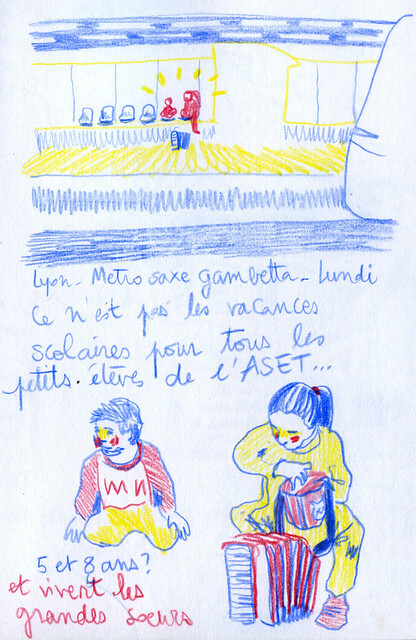 Odile and Yves teach at ASET (Help for Gipsies children to go to School). 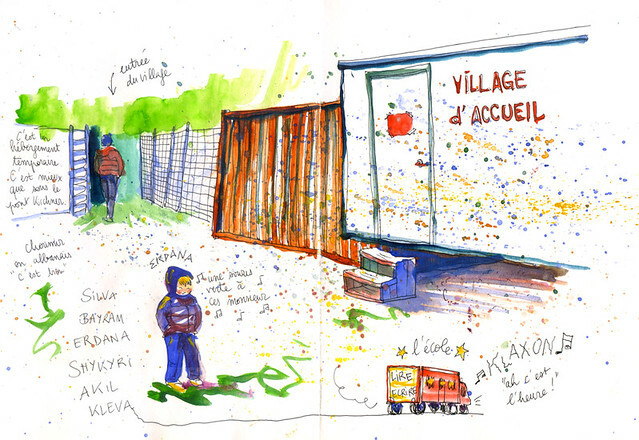 They drive around the region with their marvellous classroom-cars (school trucks !) 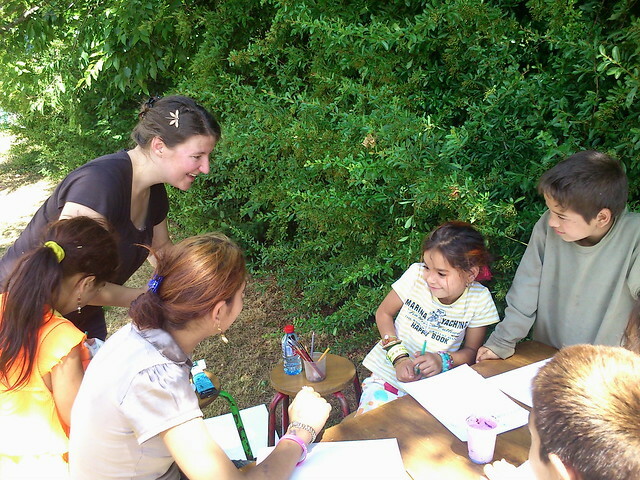 to teach French to Roma children from Eastern countries and Spanish gipsies who settled-down in France. They also teach French Gipsies children. That's how they got a classroom at the Brassens Highschool at Décines. Out-dropers can learn quietly French and Maths. They also enjoy Yves and Odile's human monitoring. 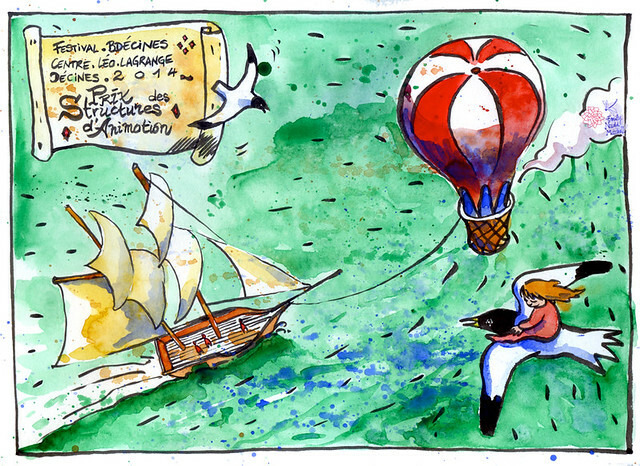 "So we're studying the Little Prince", what if he was travelling, what if he was landing on the Gipsies planet ? What would happen ?" Speaking and drawing together, they made it ! The comic is done, really good scenario and drawings. We even learnt a bit of Manouche like hello : conicava. "The little Prince on the Gipsies planet", our young writers' work, will be exhibited at the Toboggan on May, 16th at Décines. 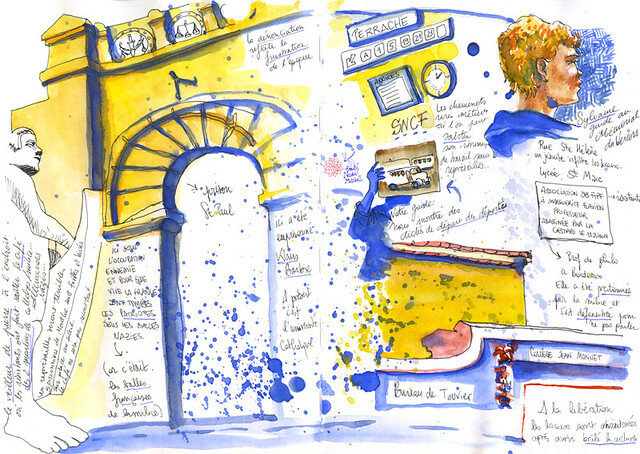 You can have a look at it on the Classe Niglo blog, and we will be there for the contest, please come and support us ! 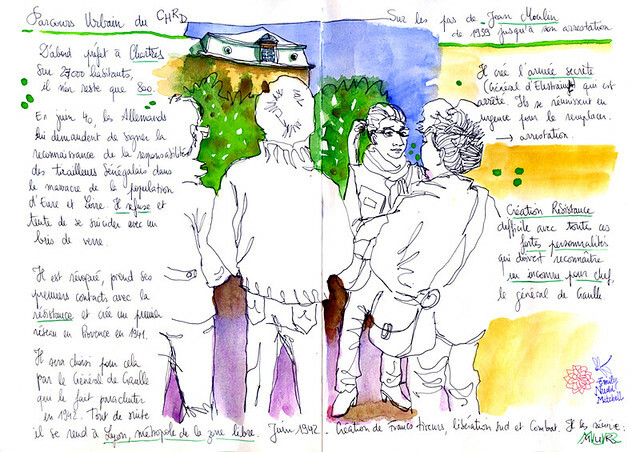 On May 17 and 18th, I will show my msketchbooks I drew at the Gipsies school in France and Spain. 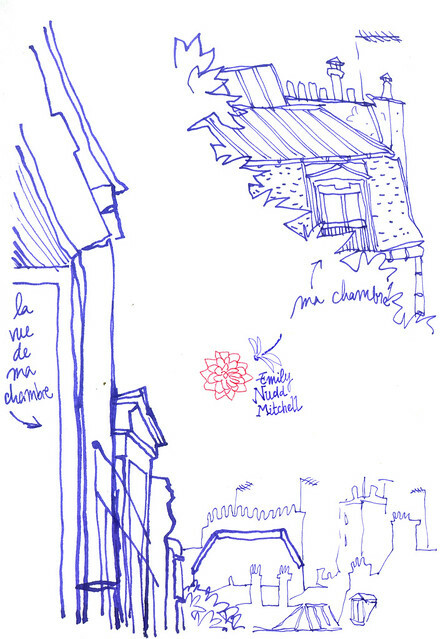 Now we're going to teach at The Saint Maries de la Mer, but I will let some new drawings before I leave. Thank you so much to Yves and Odile to welcome me in their classrooms, to share their human warmness and generous teaching methods. Gipsies School makes you feel like going back to school.